B7 is LG’s most affordable 2017 OLED TV and one of the most affordable OLED TVs. Period. Nonetheless, it still features everything you would expect from a modern TV, including 4K and Dolby Vision. 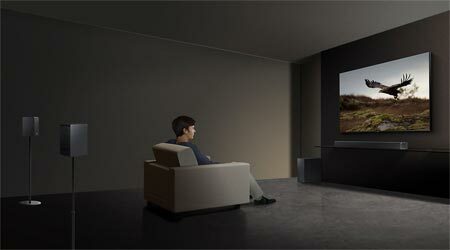 In addition, LG has added support for Dolby Atmos and equipped B7 with the latest version of its webOS platform. 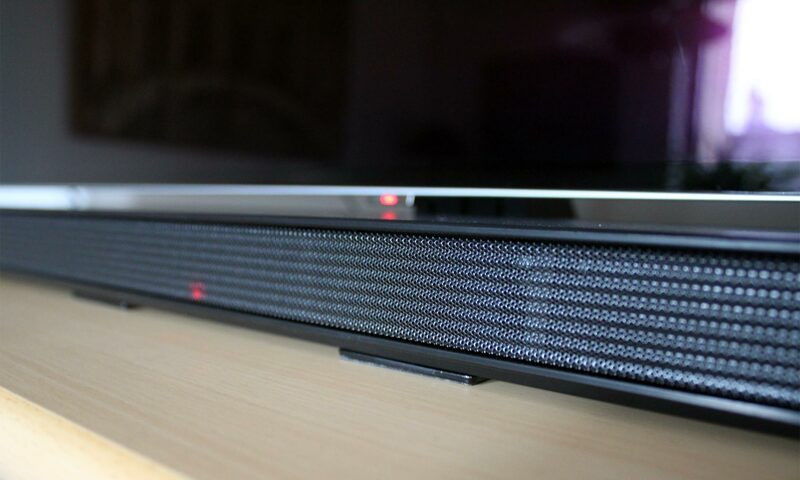 For this review we have also replaced the base with LG’s SJ8 soundbar. That sounds like a recipe for success but LG is this year facing some serious competition from Sony, Panasonic, Philips, Loewe, and others in the OLED segment. In this review we will examine B7 to see how it holds up. We have the European version of B7. The TV has a different stand in the US but is otherwise identical. For this review, LG had sent us a sample of the SJ8 soundbar, which can serve as a base for LG B7 by using a special mounting kit that must be bought separately. It makes the TV and soundbar look like a semi-integrated solution. More on that later. B7 is LG’s most affordable 2017 OLED and while it does not have the same visual elegance as the E, G, and W series, it is still an impressive TV. The OLED panel is, as usual, razor-thin. It is so thin that it can be quite daunting to unpack it due to fear of breaking it. Of course it still has the bulky electronics box on the lower half, which takes away from the elegance. Around the OLED panel is a silver-colored bezel. It is very thin but compared to LG’s E series, we found it a little distracting to the eye. We like the clean glass plate look of LG’s more expensive OLED models and that is something you have to live without when picking B7, which is of course also considerably cheaper. This is a matter of personal taste but it should be emphasized that B7 is made mostly from plastic. It lacks the premium feel that permeate more expensive OLED TVs. Turning our attention around back, we immediately noticed that several ports face out towards the wall, which may be a deal-breaker for those buyers who wish to hang the TV on a wall. 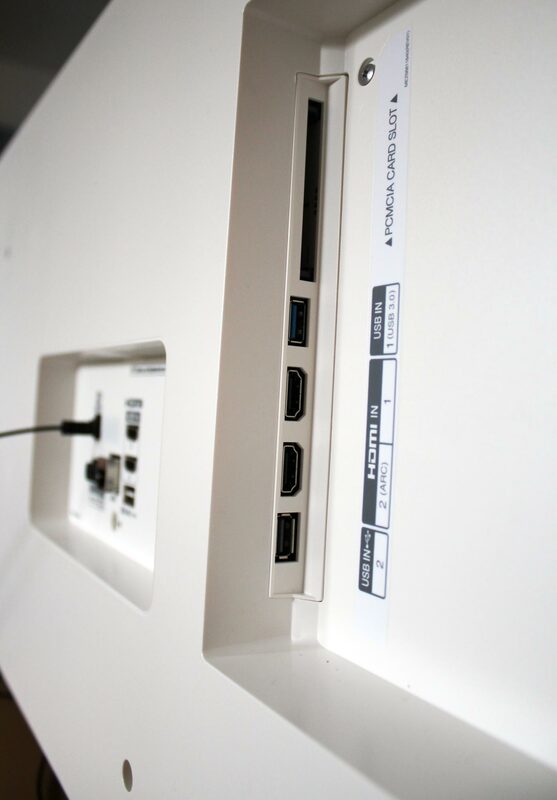 The section is slightly lowered into the white box but it will nevertheless prove a challenge to connect cables to HDMI3 and HDMI4. 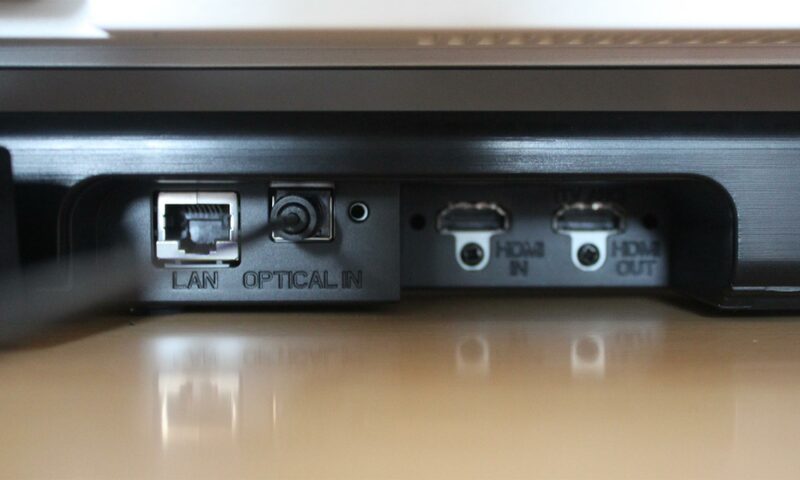 The two other HDMI ports are located on the side. This is something that manufacturers should address sooner rather than later, especially on TVs in the price segment. 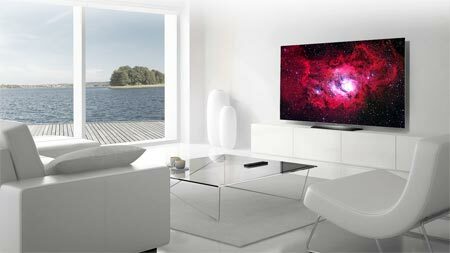 Like all other OLED TV panels (they’re all produced by LG.Display), B7 has a glossy surface that reflects bright objects in your surroundings. However, due to the fact that OLED panels are made from only one layer, the picture still looks very crisp and contrast-rich even in bright environments. 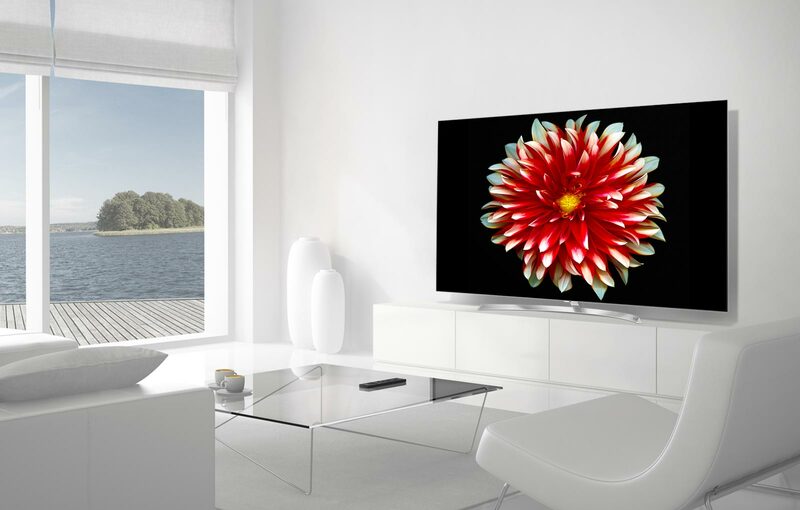 OLED panels are now bright enough to be used in all types of living rooms. LG B7 is based on webOS 3.5 and the same SoC as all other LG 2017 OLED TVs, including the most expensive W7 range. We have already examined webOS 3.5 in depth so we refer to our review of LG E7 for more details. The remote control is a slightly smaller black version. It still includes the motion sensor to let you control webOS by waving the remote around in the air. 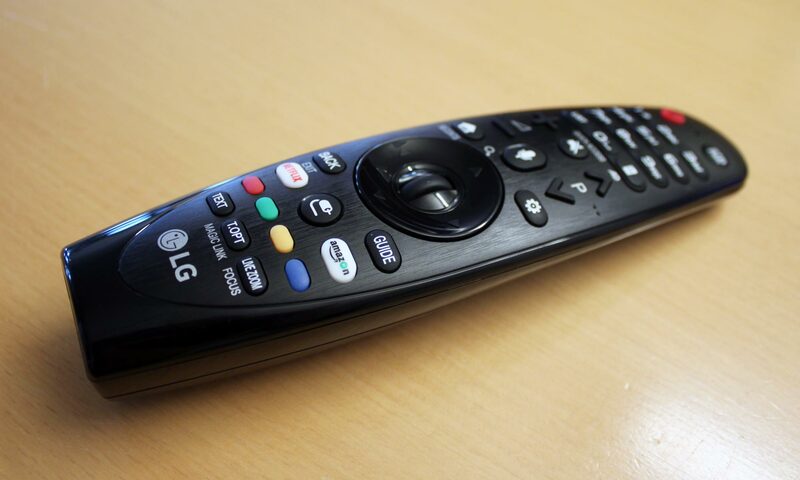 At one point, LG tried to get rid of the legacy buttons but some customers forced LG’s hand and we are back to status quo; a cluttered remote control. It even has dedicated buttons for Netflix and Amazon. Seeing what Samsung is doing with its latest remote control, we feel that LG should up its game in several areas. 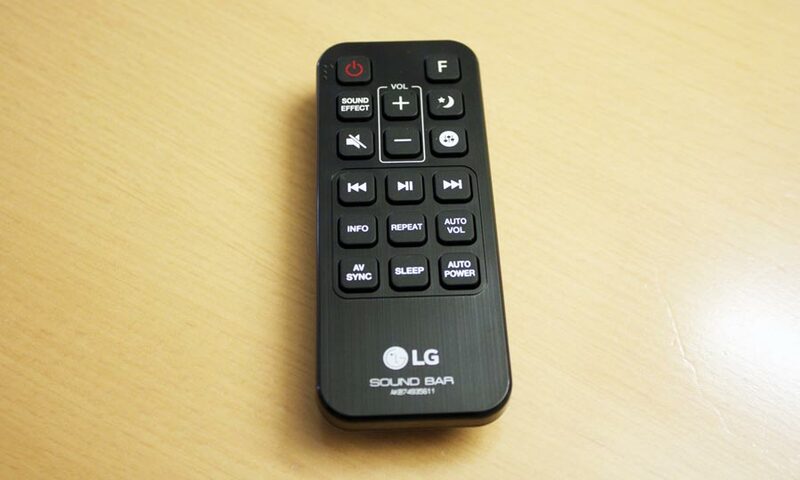 LG’s remote looks and feels cheap. It works just fine but is a confusing mess of buttons. The TV guide and all channel related features are identical to webOS 3.5 on E7 so check that review for more information. Except one detail. B7 lacks the dual tuner that is available in the European version of E7 to allow users to record TV shows onto a USB hard drive. If you don’t record broadcast TV this is 100% irrelevant for you. Lastly, B7 has a different speaker system. It still technically supports Dolby Atmos, like the more expensive LG 2017 OLED TVs, but the speakers are not powerful enough to do much with the object-based sound format. 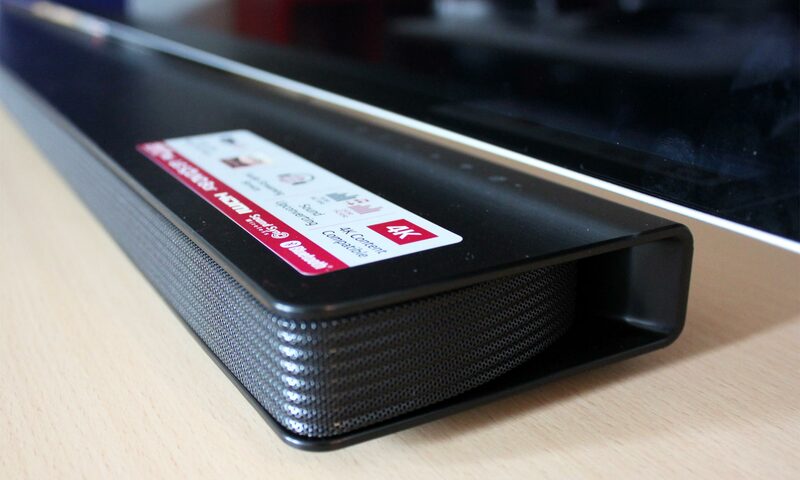 For our review, LG had sent us a sample of the SJ8 soundbar, which can serve as a base for B7. It works simply by using a support arm that must be bought separately, which attaches to the TV to take the place of the standard base. 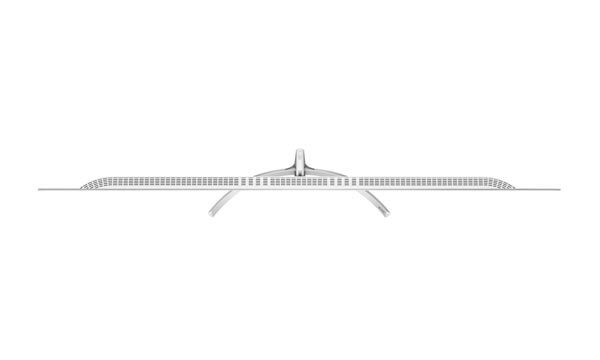 The soundbar fits into the arm, making it look like a semi-integrated installation. The soundbar can be connected to B7 via optical or HDMI, with the latter being the best choice if you want to control everything via the TV remote. 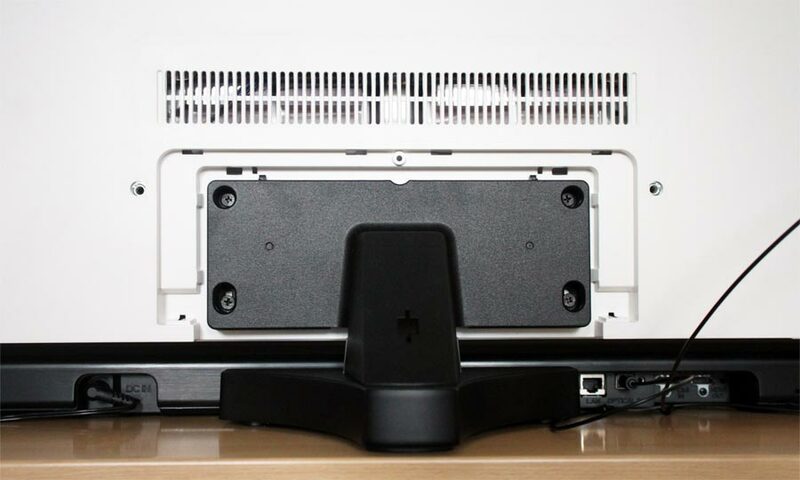 By connecting it via HDMI to the TV’s HDMI2 port, you have full HDMI ARC support as well as HDMI CEC controls, meaning that the soundbar turns on and off with the TV and that you can regulate sound volume via the TV remote. The soundbar comes with a dedicated remote but in this setup it is only required to install and adjust the soundbar. HDMI CEC control worked as expected. Technically, you lose Dolby Atmos but since the integrated speakers in B7 are not really capable of doing much with Atmos, we think that this is acceptable. On the other hand you gain with SJ8 a more powerful speaker bar and an external subwoofer. LG also sells the more expensive SJ9 soundbar, which supports Dolby Atmos. So, how does it sound? Well, the difference is noticeable when the soundbar’s subwoofer kicks in but mostly because you gain bass and depth in the sound space. 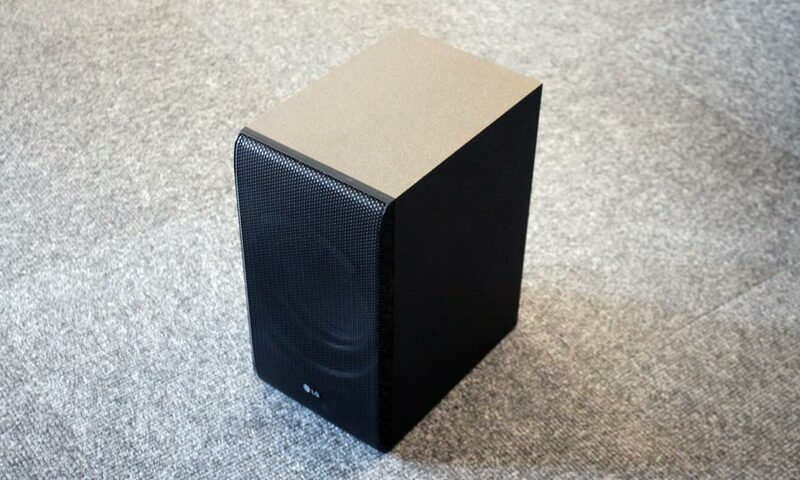 We tried turning off the subwoofer to switch between SJ8 and the built-in speakers, and without the subwoofer the difference is far from dramatic. It is perhaps worth pointing out that we had the 65” version of B7 with a larger cabinet to accommodate speakers so the difference may be more significant if you compare SJ8 to the 55” B7 but we had hoped for more. SJ8 managed to reproduce vocals with more clarity and also had a better grip on high tones but it does not hold a candle to more expensive soundbars from Hi-Fi brands. That may sound like an unfair comparison but if you spend extra money on a soundbar you expect it to significantly improve sound. This little exercise kind of made us wish that the subwoofer could be bought separately and be paired directly to the TV. Using SJ8 as a base for B7 looks decent enough but be aware that in a very dark viewing environment light from the OLED panel reflects into the top layer of the soundbar cabinet, which we found to be a little distracting (see photos in picture quality section). 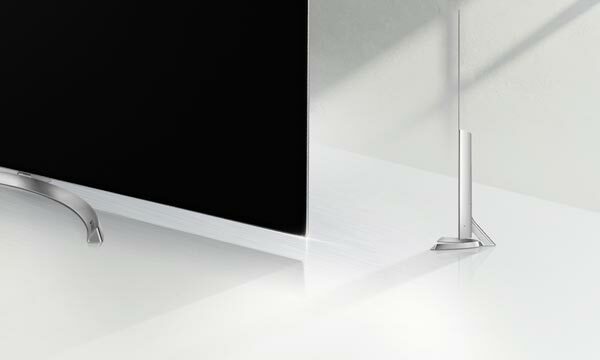 We are not convinced that the SJ8 soundbar is a must-buy for B7, despite the subwoofer lifting the sound experience somewhat. I could include my usual rant, telling you how the default picture settings ruin an otherwise excellent OLED panel through perverse measures such as artificial sharpness, strange motion artefacts, and a default color mode that pulls colors out into a too wide color gamut, resulting in wildly inaccurate colors. Well, I guess I just did but I don’t want to go into all of this in more detail. If you have read some of our previous reviews you will know that no TV manufacturer today rises above the rest. It seems as if the default color mode has become an exercise in the most extreme colors where each manufacturer tries to one-up the next. 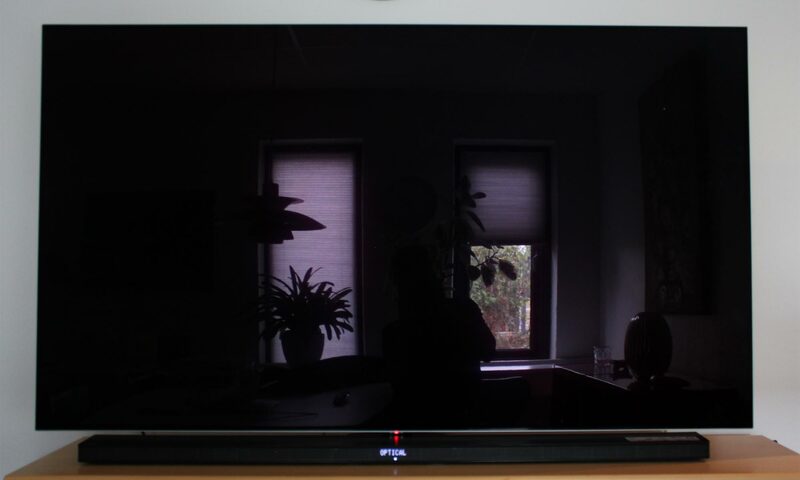 Luckily, LG has included two ‘ISF Expert’ modes – one for dark room viewing and one for bright room viewing – and these are in a totally different league. 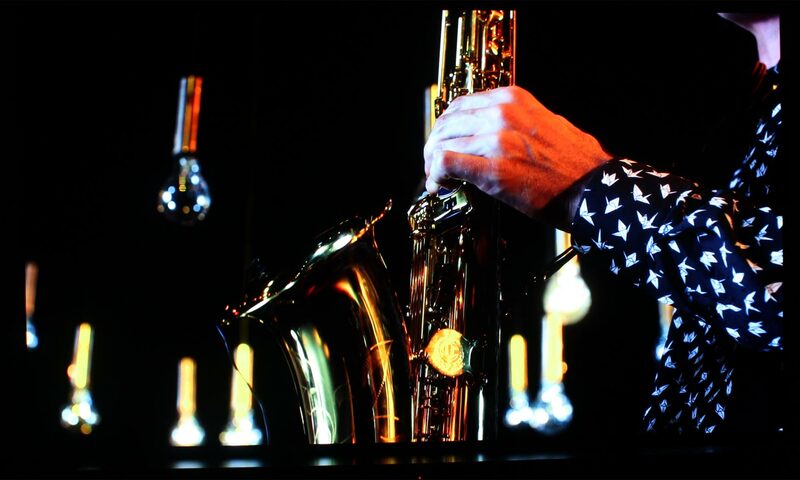 The two color modes offer very accurate colors and with relatively modest adjustment we reached an impressive result. 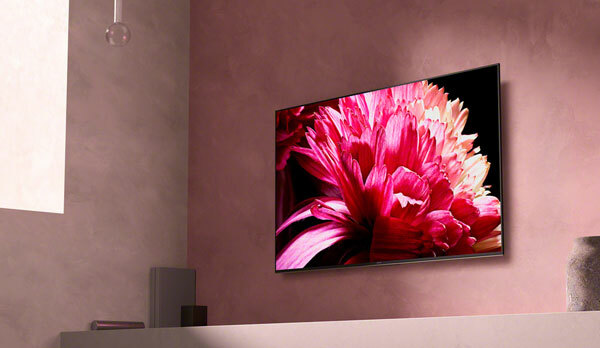 A few years ago, you would encounter some challenges when calibrating an OLED TV but LG has managed to make the panel more and more consistent (partly because of less aggressive ABL), which means that it is now far easier. As you can see in the graph, we reached relatively low dE values for colors and an almost spot-on grey scale only by using the simple 2-point settings. If you want to go more advanced, the TV offers a full CMS and 10-point setting options. As you can also see in the diagrams below, we measured DCI-P3 to around 96% percent coverage, which is the norm for the 2017 OLED panel. We do not calibrate for HDR yet but should probably say that doing so requires a little more effort than described above (for SDR) because the default HDR modes are not as accurate as the ISF Expert modes. 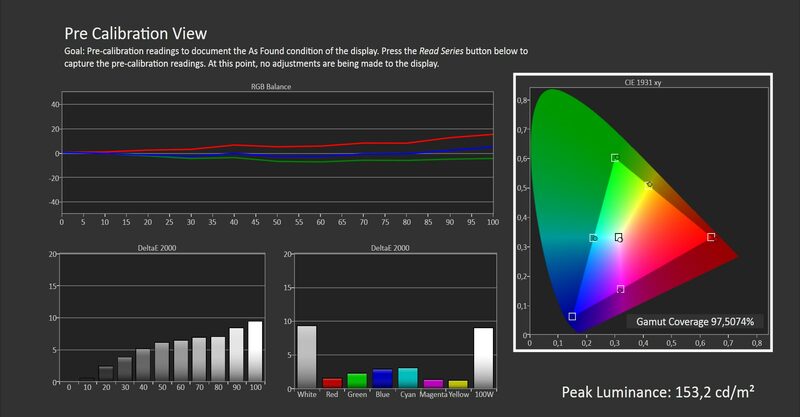 We are not convinced that you can reach a spot-on result either based on the limited tools available in the menu for HDR calibration. LG says that all of its 2017 OLED TVs are based on the same panel and the same video processing engine – from B7 to the most expensive W7 – meaning that B7 should perform more or less identically to the E7 that we reviewed back in June. This is one of the claims that we would like to check but we also want to expand on the topic of picture quality on 2017 OLED TVs. Let us start from the bottom by commenting on how B7 handles SD and HD material. In our review of LG E7 in June, Torben wrote that “the upscaling engine handles upscaling from HD and SD well but LG’s processing is not as good as Sony’s X1 Extreme or Panasonic’s HCX engine. 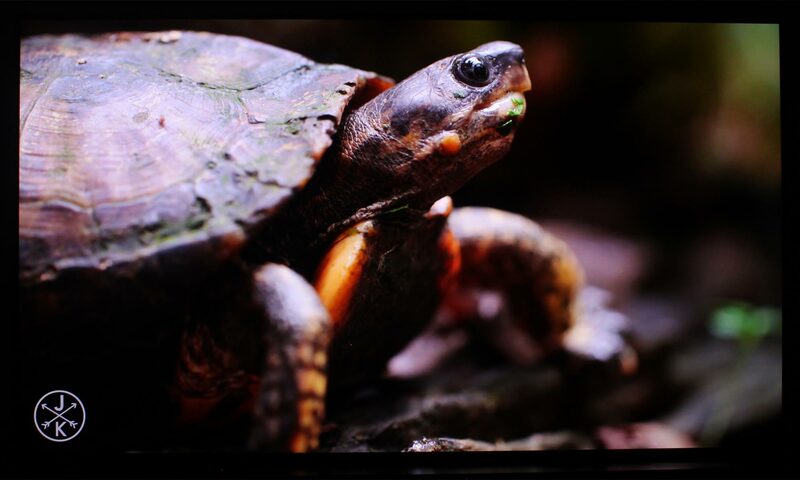 The advantages of OLED’s pure black and intense highlights, however, are seen on all types of materials so you get a great contrast-rich picture regardless of the source”. There is not much more to add on the subject other than to say that B7 performs identically. B7 is far cheaper than E7 but you can still expect the same excellent picture quality even if you feed it with relatively low-quality material by today’s standards. We have yet to encounter an OLED TV that is not up amongst the best TVs we have tested in terms of picture quality, which says a lot about the consistency of OLED TVs. Switching our attention to 4K and HDR, this is where LG B7 excels. 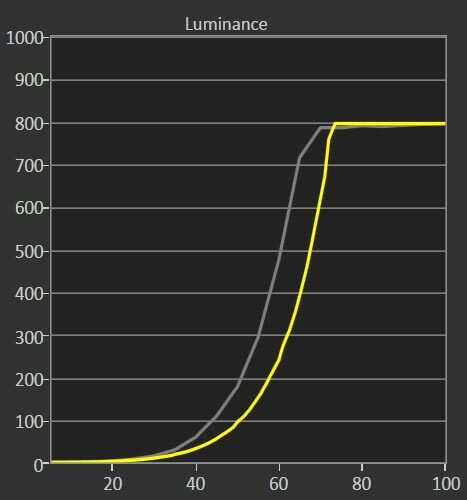 We actually measured slightly higher peak brightness on B7 compared to E7 (730 vs. 710 nits). The difference is negligible and likely comes down to panel variation or some further optimizations by LG in the production process. 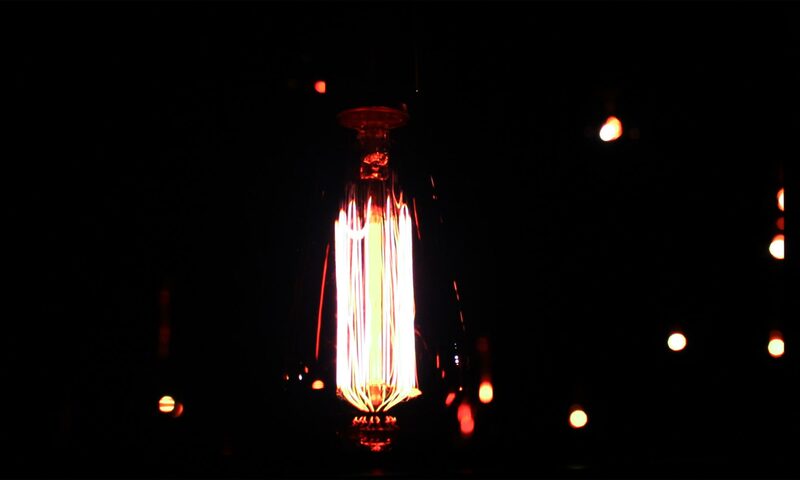 LG proclaimed that this year’s OLED panel could approach 1000 nits in peak brightness in special situations but be aware that this is only possible at much higher color temperatures, which makes the picture look too bluish and cold. Switching to the ‘Cinema Home’ mode, we could hit just over 780 nits (10% window - also see graph to the right) while still maintaining decent picture quality so it can be pushed further (a smaller than 10% window will also return a higher peak level) but there is still room for improvement in this area. 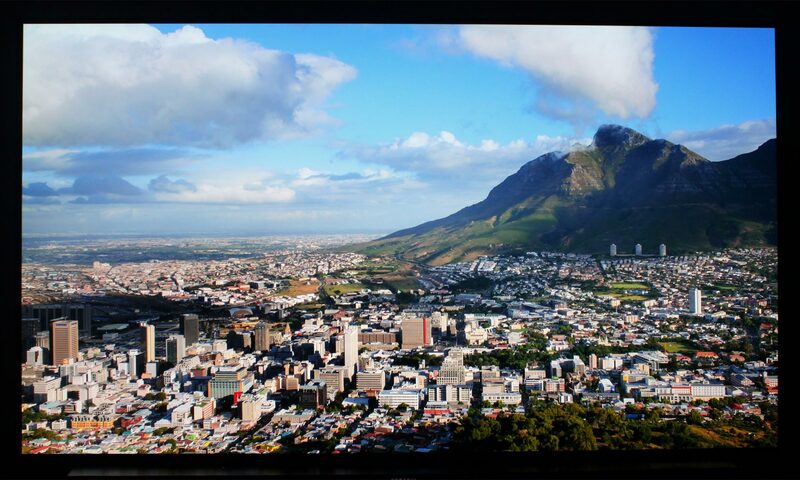 Regardless, HDR material looks amazing on B7, especially in 4K resolution on the 65” panel. For the review we fed the TV with a variety of sources, including UHD Blu-rays from a Panasonic UB700 player, Netflix content, and test clips. 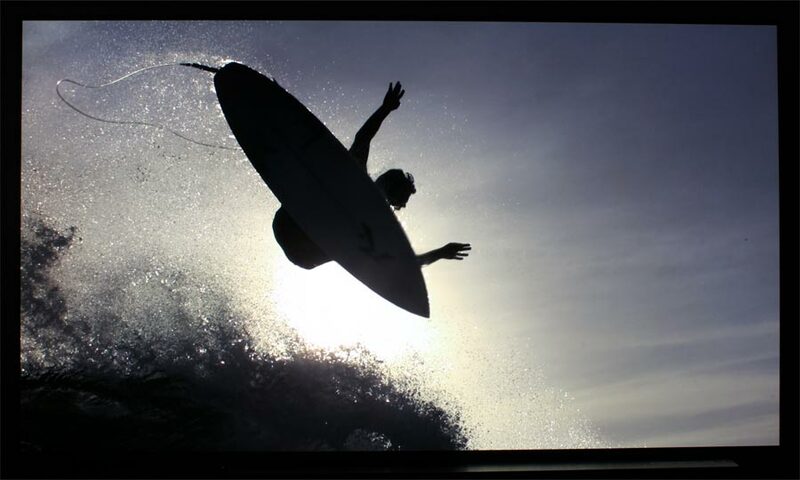 B7 reproduces HDR consistently – without light fluctuations that we encounter on edge-lit LCD TVs – and with details better preserved in the darkest and brightest tones compared to 2016 models. This is partly because of reduced black crush on the panel and better tone-mapping at the high end of the luminance spectrum to preserve details in highlights. These improvements are subtle but noticeable if you know what to look for and it shows up even with HDR10 content. Dolby Vision content can improve things further by utilizing the dynamic metadata processing. 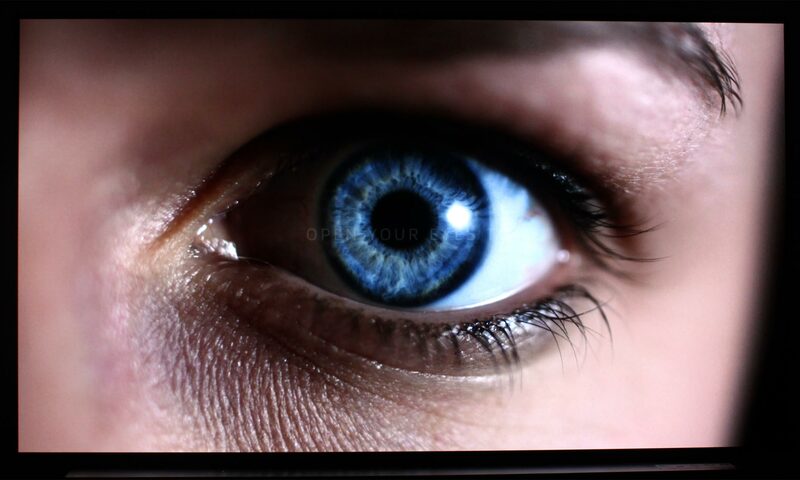 Unfortunately, we were still waiting for the firmware update for UP970 at the time of review and Apple TV 4K hadn’t arrived yet but we examined our Dolby Vision test clips that looked as good as ever. Speaking of Dolby Vision, Apple TV 4K has made us aware of a serious limitation on the 2016 LG OLED TVs, which is that they cannot process Dolby Vision at 50 or 60 Hz via HDMI (30 Hz is the cap). LG’s 2017 OLED TVs can, which going forward will be one significant difference between the two line-ups because it means that 2017 OLED TVs are prepared for, amongst other things, broadcast channels in Dolby Vision quality (and of course Apple TV 4K). This is a very serious shortcoming of LG’s 2016 OLEDs and even though we are happy that it has been addressed with the 2017 OLED line-up, LG should have informed about this and will need to address it on some level. LG will later this year add support for Technicolors’s HDR format via a firmware update, which will be the fourth HDR format to be supported by the 2017 models. There is no content offered in the format yet so the importance is difficult to gauge at this point. The other three formats are HDR10, HLG, and Dolby Vision, meaning that the only one missing is HDR10+ that Samsung and Panasonic have put their weight behind to counter Dolby Vision. We can confirm that HDR10, HLG, and Dolby Vision work as expected and we continue to be impressed about how well OLED displays reproduce HDR. 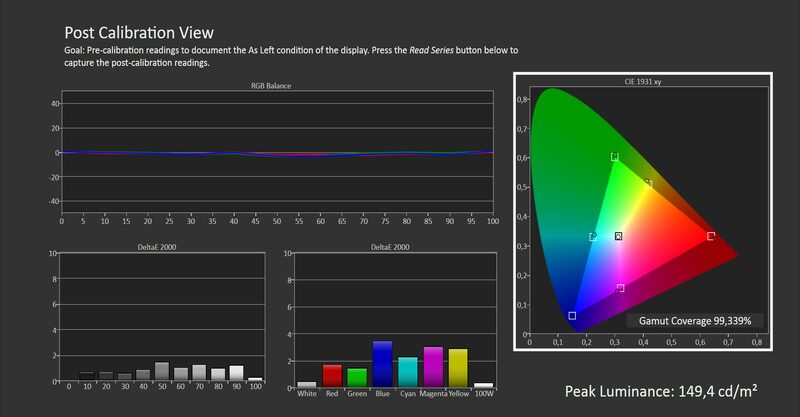 There is still room for improvement on the path to even more impressive HDR with Rec.2020 colors and far higher peak brightness but that is a subject for the future. 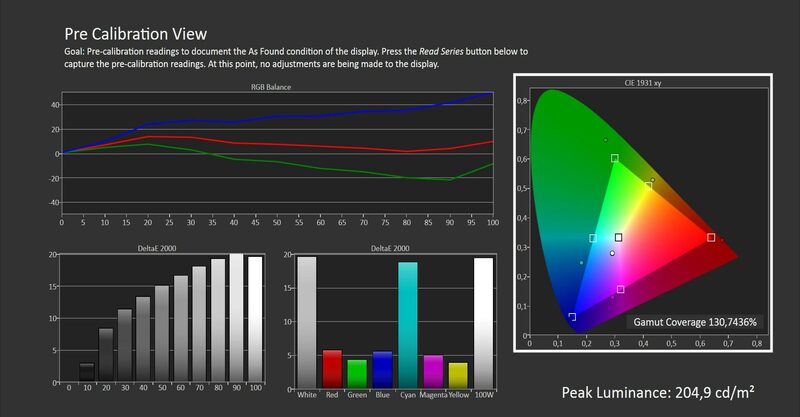 The Dolby Vision color modes on B7 are more accurate than the HDR10 color modes so we hope that LG will dedicate more time to calibrate the HDR colors modes in the future. 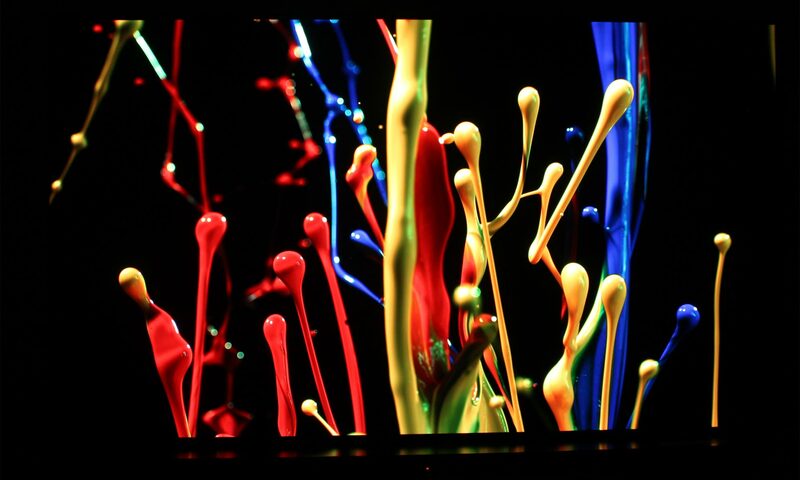 Regardless, 2017 OLED TVs currently offer the best HDR picture experience that you can buy, with perfect black, pixel-level luminance control, support for DCI-P3, and peak brightness of around 700 nits. 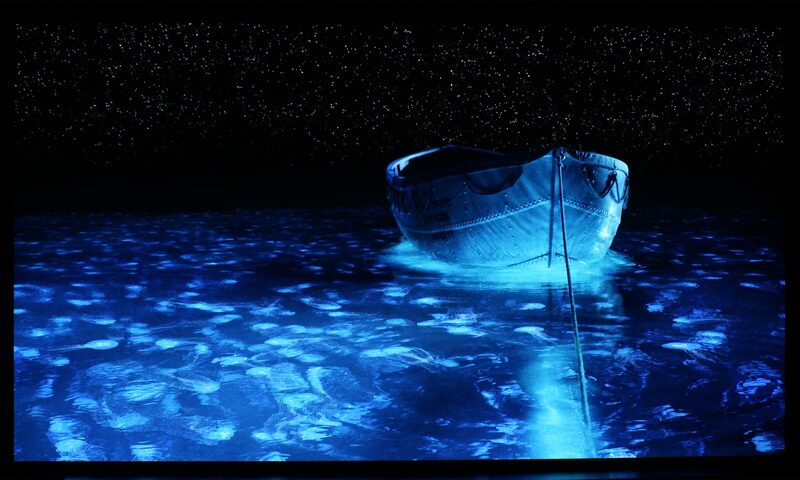 This combination, with pixel-level control being the most important, can reproduce truly dazzling pictures with extreme contrast, as evidenced by the ‘Life of Pi’ night scene above, and in the very clean and intense colors in the scene with the exploding paint. 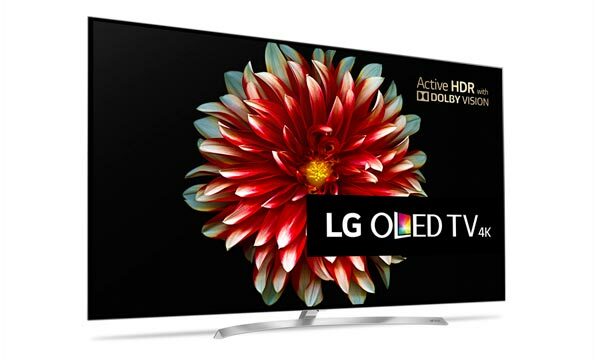 If we had to briefly comment on content sources it can be noted that LG has in its 2017 OLED TVs finally added support for Google’s VP9-2 format, meaning that you can enjoy YouTube in 4K HDR quality (PQ and HLG). The Amazon and Netflix apps both deliver 4K HDR (and Dolby Vision) streams via HEVC, which was also supported in last year’s models. However, webOS lacks access to 4K HDR from the Google Play Movies app and, unsurprisingly, Apple iTunes. webOS is a decent TV platform but if you want access to more sources you should consider adding an external player of some sort. On the other hand we continue to be unimpressed but LG’s TruMotion engine that trails Sony’s MotionFlow. The industry will over the coming years start flirting with HFR – High Frame Rate – and LG has already showcased OLED prototypes capable of receiving and processing input in 100/120fps. This will drastically improve clarity in motion but until we get there some viewers prefer to engage the motion system either to counter judder/stutter and smooth out motion (motion interpolation) or to reduce blur inherent in the content through various means. LG’s TruMotion processing, even at its lowest setting, introduces the “soap opera” effect and artefacts around moving objects. We prefer to turn it off completely. If you prefer to use motion compensation engines (and it should be emphasized that many people prefer not to) you should check out Sony or Philips’ OLED TVs that perform better in this area. With that being said you cannot fault LG’s “natural”, so to speak, reproduction of motion. It can reproduce 24Hz content as intended. It also has one of the lowest input lag figures that we have measured to date with just 21.4 ms in the game mode. This input lag figure applies to both SDR and HDR, which means that LG 2017 OLED TVs are the best TVs for gaming that you can find! We cannot stress enough how significant HDR is for gaming. If you haven’t tried it on an OLED TV you are seriously missing out. OLED TV panels continue to suffer from some panel homogeneity issues, typically observed in the very darkest grey tones or the brightest grey tones. B7 is no exception. The panel exhibited some banding on a 5% grey pattern but we did not observe it during practical use. There was a very faint yellow tint on a white background but it was so faint that most people would have trouble spotting it and we did not manage to capture the effect on camera.  If you look closely you can in the third picture above see a faint outline of a box in the very center of the panel. This is a 10% window that we use for measurements and calibration, which has stuck on the panel as retention. 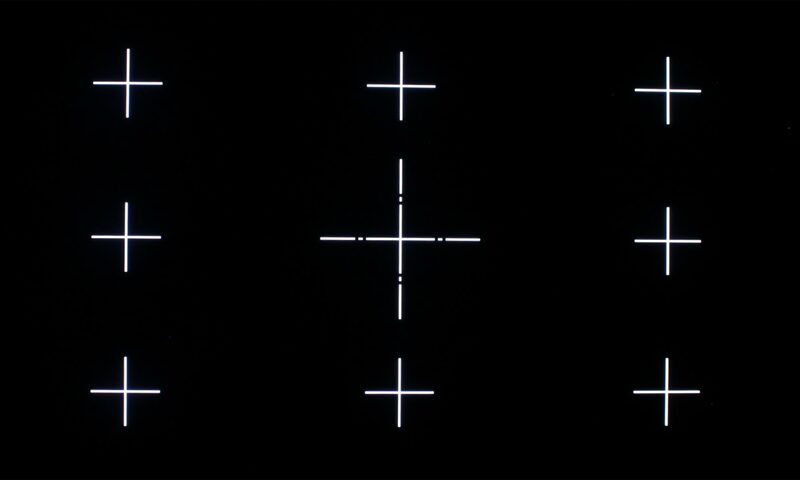 We did not actually see it and a 2s exposure shot was needed (plus 1-2 hours of measurements with the 10% window) to reveal that it was there but as always we should emphasize that retention is possible on OLED panels. The situation is nothing like the plasma days and based on our experience to date there is nothing to fear. 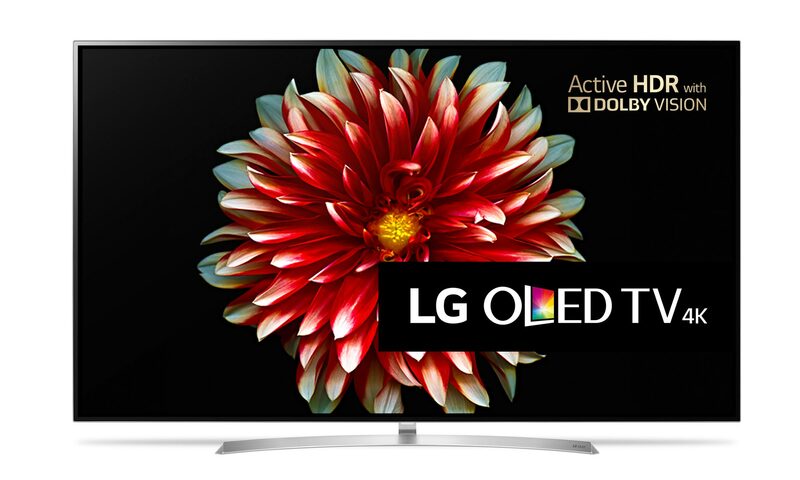 Just use an OLED TV like you normally would. We have used them for 6-8 hours straight for gaming without issues. 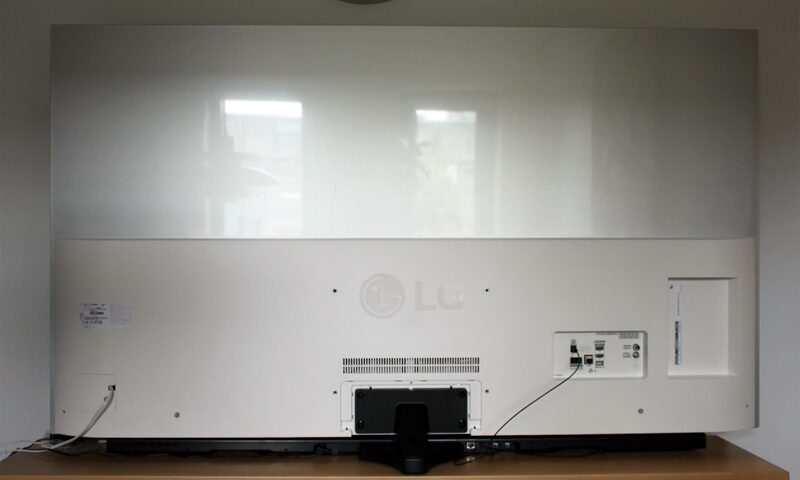 If you are unlucky enough to provoke retention, the panel will run a cleaning process when turned off (it needs stand-by power), meaning that it will be gone the next morning. 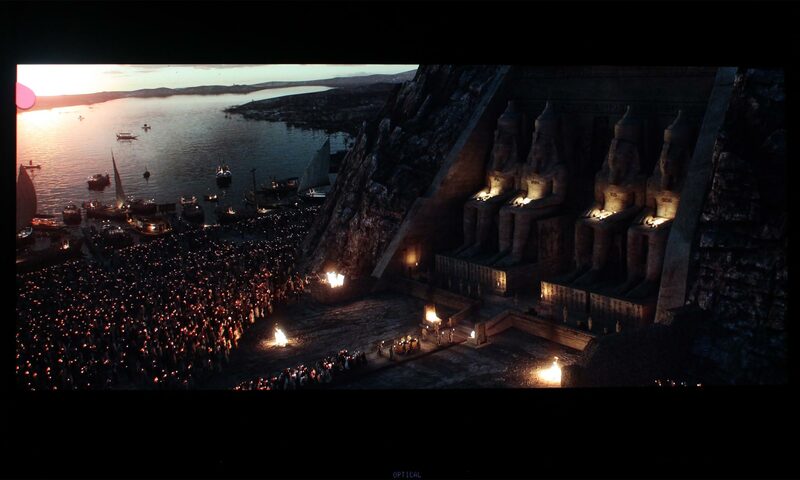 It is no longer relevant to examine viewing angles. Some earlier OLEDs exhibited some mild color tinting, which was caused by the coating on the panel but LG.Display has effectively eliminated the effect, meaning that you get close to perfect contrast and colors even from the most extremely angles. LG B7 is, at its core, the same TV as the more expensive E7 that we reviewed in June. You get the same OLED panel run by the same video processor. You get webOS 3.5 run by the same SoC. You get 4K resolution and support for all of LG’s supported HDR formats, including Dolby Vision. What you don’t get is the elegant glass design, front-firing speakers, and the dual tuner (in Europe). If you can live without those things, and can live with some of the best picture quality available on the market with those celebrated inky blacks, B7 is for you. 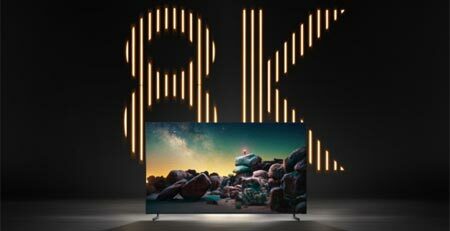 There are some differences between LG, Sony, Philips, and Panasonic’s OLED TVs but they are not huge, and B7 has the edge in two areas; input lag and support for Dolby Vision (coming to Sony A1 later). OLED continues to deliver the best SDR and HDR picture quality that money can buy, and B7 adds to that by being the best TV for console gaming in HDR, which is something that you should treat yourself to if you have yet to try it. LG B7 is definitely not perfect. 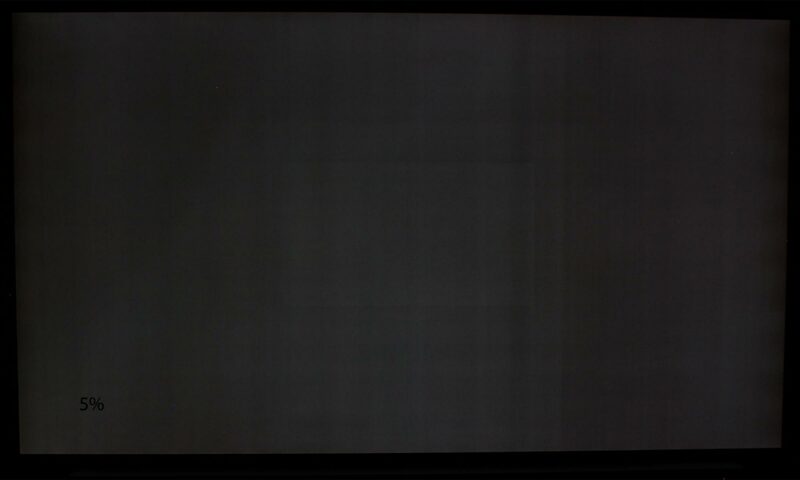 We are disappointed that several inputs are rear-facing and that OLED panels continue to suffer from inhomogeneity in the darkest grey tones. The HDR10 picture modes need better factory calibration and the “Dolby Atmos” speakers are not very powerful. LG stubbornly continues to refuse to update webOS year-over-year, which defeats the purpose of having a TV platform to begin with. LG had loaned us the SJ8 soundbar, which can serve as a base for B7 instead of the regular base, but the soundbar was a little disappointing, which made us wish that it was possible to just to connect the wireless subwoofer directly to the TV. Still, those are all things that we can accept because we forget about all those annoyances when the picture comes on. B7 performs like far more expensive OLED TVs and it is honestly a small wonder that you can get such excellent picture quality for such an attractive price. B7 has deserved our Highly Recommended Award more than any other TV in recent years.